NO FAIR!! What teacher or parent has not heard that lament from children? I’ve been exploring the concept of what is fair and what is not fair according to preschoolers. Not fair can mean many things, including someone not what they wanted, being excluded from something or something undesirable occurring. In the world of art making, we teachers and parents have the opportunity to explore what feels fair to children. In the process, we get a glimpse into their unique worlds. Once inside, we can gather information for helping the children solve conflict or working together more joyfully. 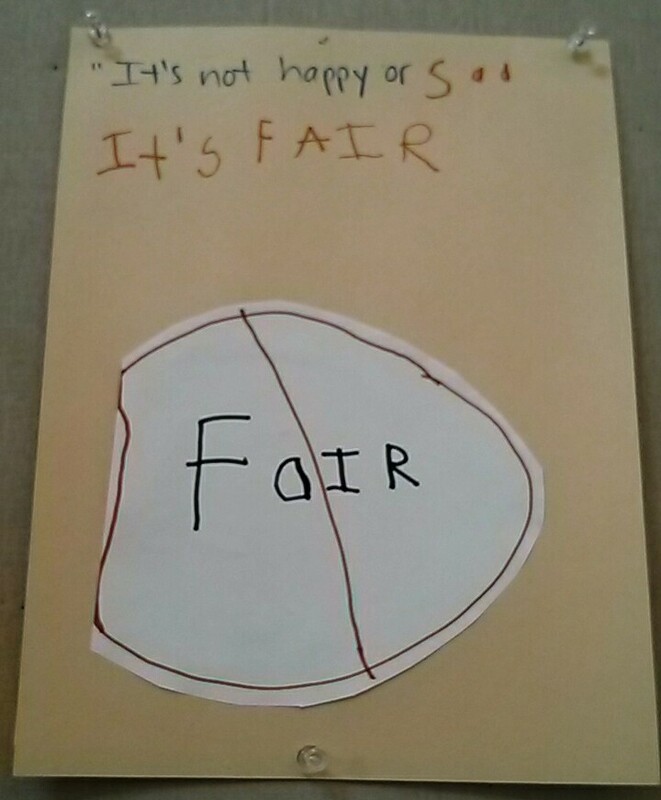 I asked a group of 3 and 4 year olds what “fair” meant to them. “What is fair?” I asked. After a long pause, one 4 year old said, “It’s not happy, it’s not sad, it’s fair.” He then wrote his words, trying to grasp and express the abstract concept. He grouped fairness with feelings. I thought about that and concurred that when something was fair we could feel it inside our bodies. It is kinesthetic, a sensation of well-being that accompanies our sense of fairness. While adults may not as easily access the sensations, children more-readily can. And unfairness is often felt intensely by children. “What is ‘not fair? '” I inquired of the same boy. Previously he had shown interest in a “No Parking” sign. When asked what a “No Fair” sign would look like, he thought for a moment, then sounded out and wrote “Fair,” encircled it and drew a line through it. I acknowledge all their responses. I found that with those directions they didn’t fight or accuse each other of having more. Each chose what he or she wanted and seemed to be satisfied. If they wanted more than the designated amount of strips, I’d ask what their plans were. 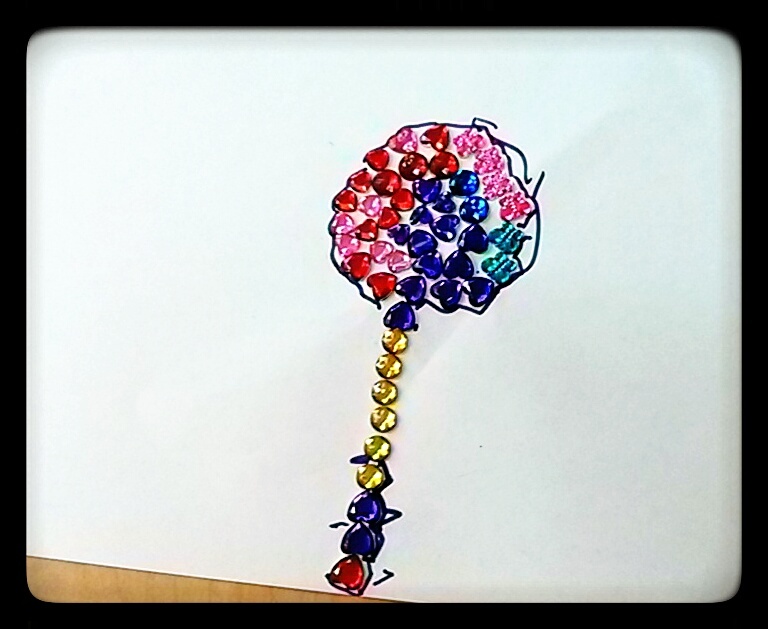 One 5 year old needed just two more jewels to form the outer circle of her flower. It seemed “fair” to me to give permission for two more. While everyone at her table looked up, I took their silence as agreement. Something else I tried was to have the group decide on what was fair. When that day’s allotment of “two strips of jewels no matter what the size or amount” was not heeded by one of the children, a roar went up. “She has much more than two strips,” came the cry of injustice. Looking at what they pointed out, I could see their point. “That’s OK with me,” one girl answered. “Doesn’t bother me,” said a 5 year old boy. One by one the children voiced their approval of one more jewel… until another voice was heard, “Well, it’s not OK with me!” Before she could express why she felt this way, another child pointed out that this girl didn’t have any jewels. “Oh, you don’t have any. Did you want some?” I asked. 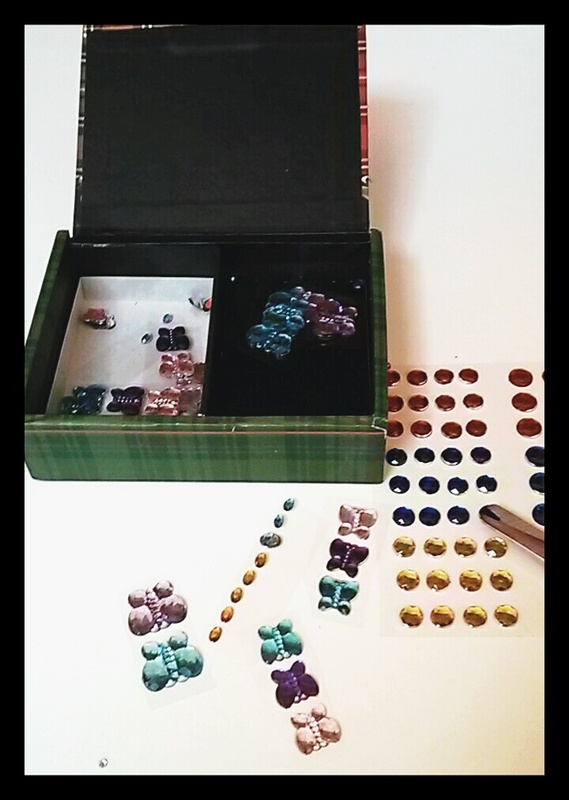 “Yes, I do,” she answered, and a friend spontaneously brought over the box of sticky jewels. “Can I have the heart jewel now,” asked the child who needed just one more. “You can,” was the reply. “Sometimes, when we get what we need, we feel more generous,” I commented. When there are special supplies that are in demand, we can offer them in different sizes, shapes and amounts, asking the children to take what they really want. Some will say none, some will chose according to size or color or shape, and others will choose by the amount they will receive. While it’s developmentally appropriate for young children to see “fair” as always equal, as teachers and parents we can help stretch their concept of fair. ‘”Loose parts,'” as mentioned in my blog of May 3, 2013, describes a theory first proposed by Simon Nicholson regarding open-ended materials. 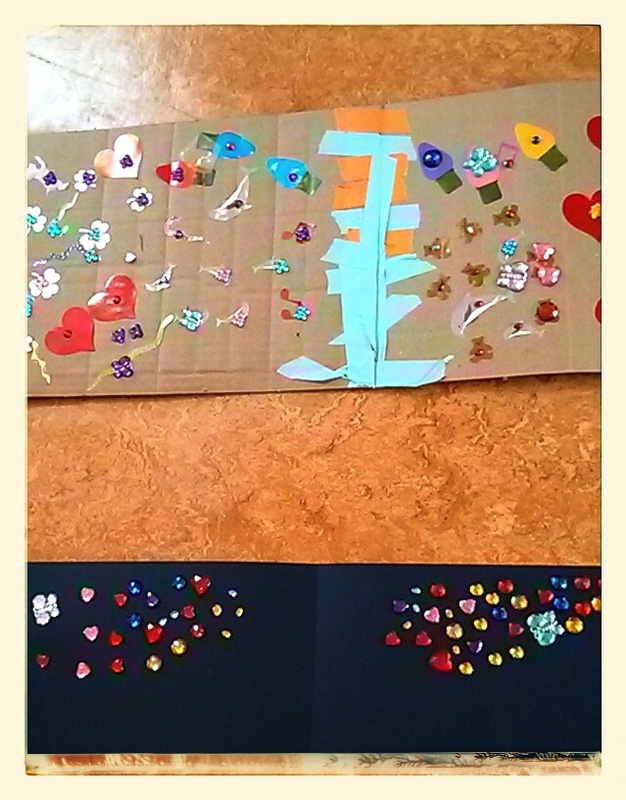 These materials suggest no fixed direction other than what is imagined by the children themselves. Nicholson, and others who followed him, proposed that these materials empower our creativity. Focus and concentration are enhanced by combining loose parts with intrinsic motivation, that comes from within the child. Over a period of several weeks, I observed one five year old’s interest in fabric. 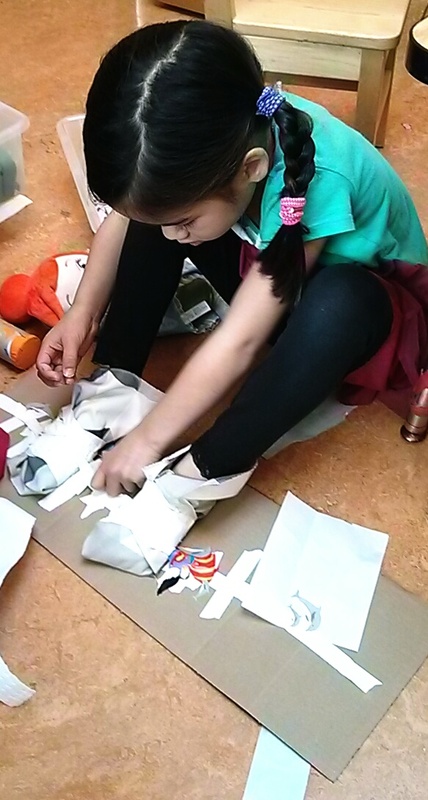 She began by covering her feet in cloth squares and wrapping them with colored masking tape. 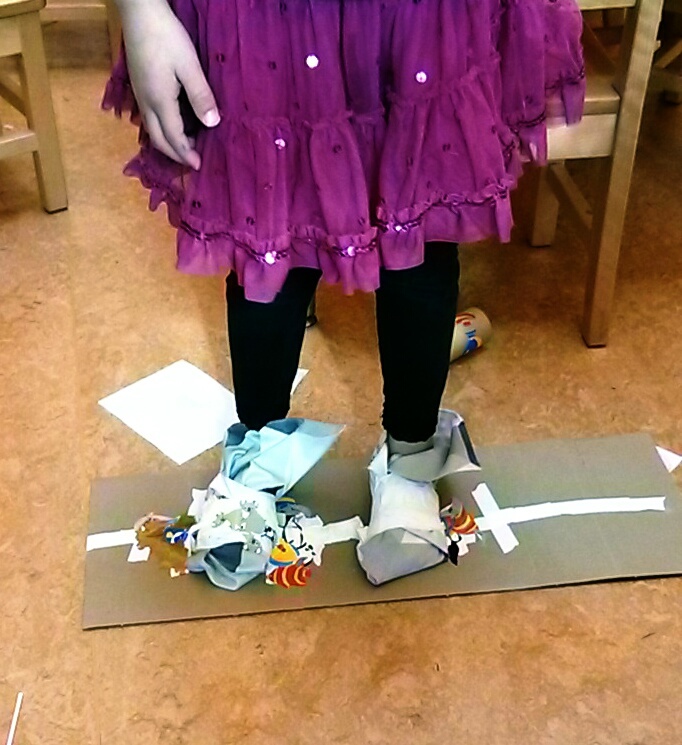 After several sessions of “shoe” making, she chose cardboard from the recycled materials and placed her shoe-covered foot on top. Voila! 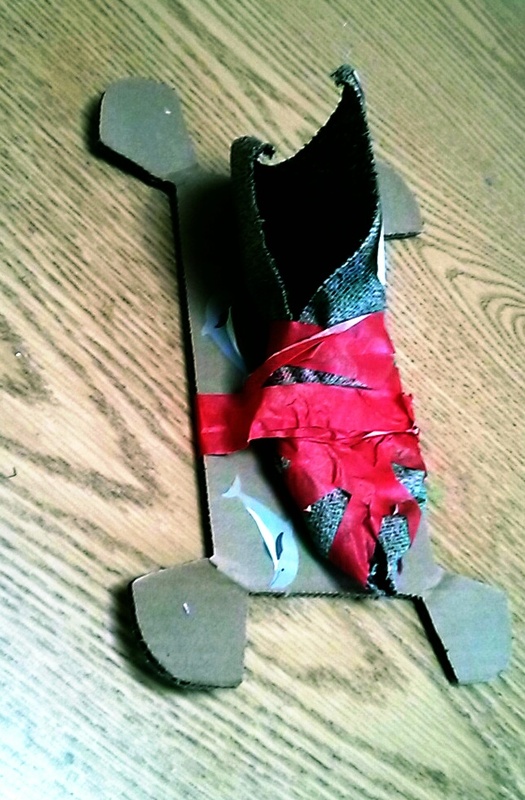 They became ice skates. She slid around the room on her ice skates with great pleasure. When she returned for the next session, she chose a large piece of cardboard and began decorating it. 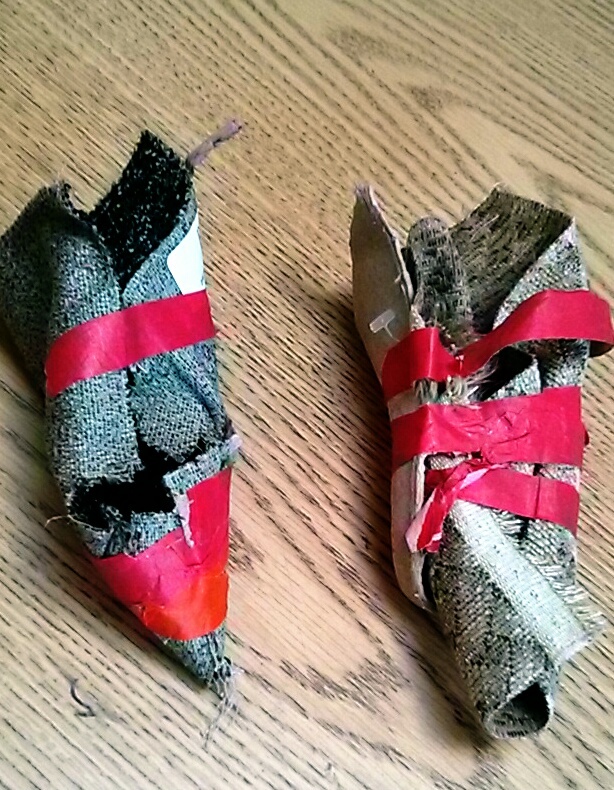 Instead of fabric, she cut up strips of available paper and again wrapped her feet. 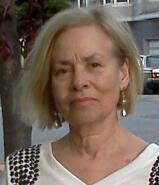 Having a variety of open-ended materials available allowed her to continue pursuing her passionate ideas. This time she created a snowboard. Her confidence and satisfaction with her projects grew with the challenges she gave herself. An article on intrinsic motivation by the National Association of School Psychologists addresses some of the characteristics that develop when children are self-motivated. Persistence: The ability to stay with the task. A highly-motivated child will stay involved for a long period of time. I’ve observed young children work steadily for 1.5 hours and put their project on a saving shelf for additional work at a later time. They learn persistence when they are successful at a challenging task. Confidence: A developing ability to problem solve is the basis for motivation at this stage of development. Having the self-confidence to know that one can solve a problem motivates the learner to accept other new and challenging situations, which in turn leads to greater learning. Independence: The decreased amount of dependency on adults is another indicator of self- motivation. Children with strong intrinsic motivation do not need an adult constantly watching and helping with activities. Since independence is an important aspect of quality learning, this decreased dependence on adults will greatly enhance children’s ability to succeed in school. Concentration and focus are greatly enhanced when children are self-motivated. Providing a variety of open-ended materials for creative expression expands intrinsic motivation. For children to discover and explore their interests and passions at an early age informs their course of self-study and choices for a lifetime. Instructional scaffolding is a learning process designed to promote a deeper level of learning. It is the support given during the learning process that is tailored to the needs of the student with the intention of helping the student achieve his/her learning goals (Sawyer, 2006). Scaffolding comes from Lev Vygotsky’s concept of an expert assisting a novice, or an apprentice. Though the term was never used by Vygotsky, interactional support and the process by which adults mediate a child’s attempts to take on new learning has come to be termed “scaffolding.” Scaffolding represents the helpful interactions between adult and child that enable the child to do something beyond his or her independent efforts. A scaffold is a temporary framework that is put up for support and access to meaning and taken away as needed when the child secures control of success with a task. 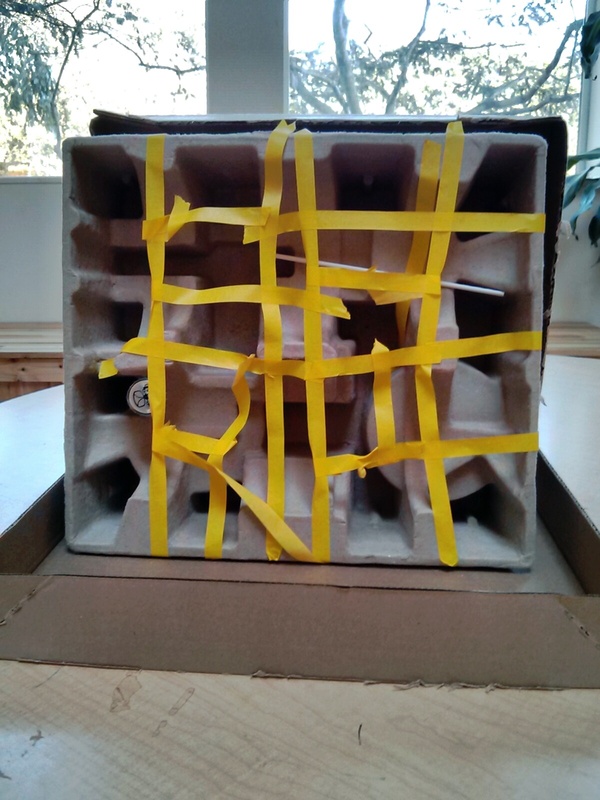 In expressive arts, where the art-making is child-generated, I use scaffolding with laser precision, though only when appropriate and after I carefully discover what the child has in mind. A combination of knowing the child, the delivery of suggestion, the child’s readiness, and timing go into whether the child will allow for the scaffolding. 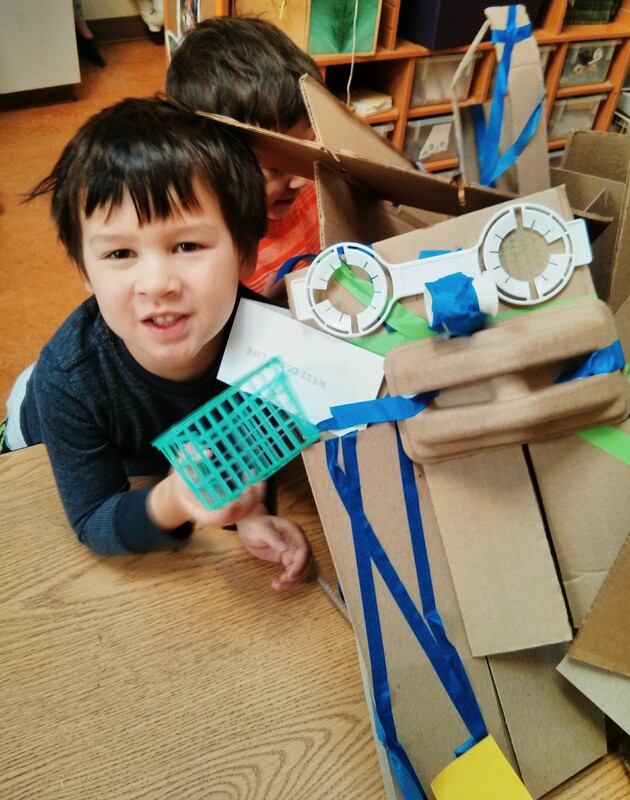 A 4 year old made a paper bag puppet with sticker eyes and a wonderful jagged-line mouth. As he’d left the body of the bag bare, I asked if he’d like to make clothes for it. He was excited and chose a piece of fabric. The difficulty of cutting the fabric soon became evident. I asked if he’d prefer to make it from paper, to which he readily agreed. He chose a piece of orange paper and snipped two triangles off the corners. “Oh look, it’s underpants.” He smiled, recognizing what his cutting had unintentionally created. 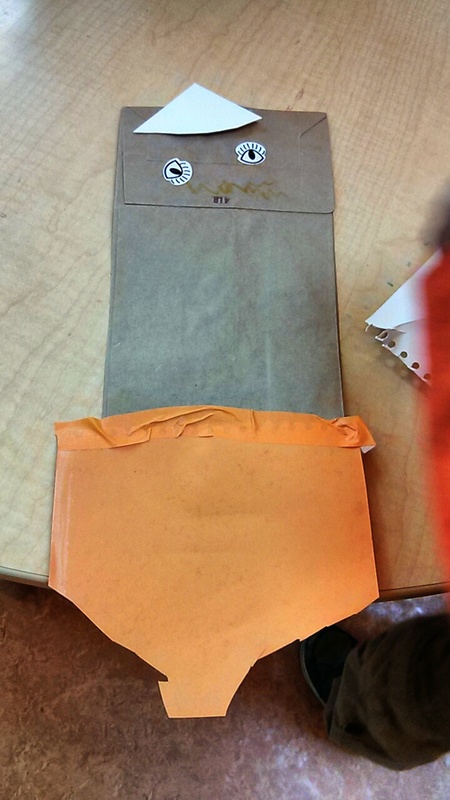 With that, he carefully cut a long piece of orange masking tape and attached it to the bottom of the bag. He snipped another triangle and called it a hat. The boy then decided to use a bench as a puppet theater and taped the puppet to the back of the bench. The little spark that occurred as a result of scaffolding grew into a fire of creativity. Often it is the children themselves who scaffold. When a 3 year old shivered in fright and asked me to put away the larger-than-child-sized Turtle puppet, I first explained what it was made of. (fabric, buttons, shoulder pads, etc.). I wanted her to know that it was not alive, although it seemed to be. 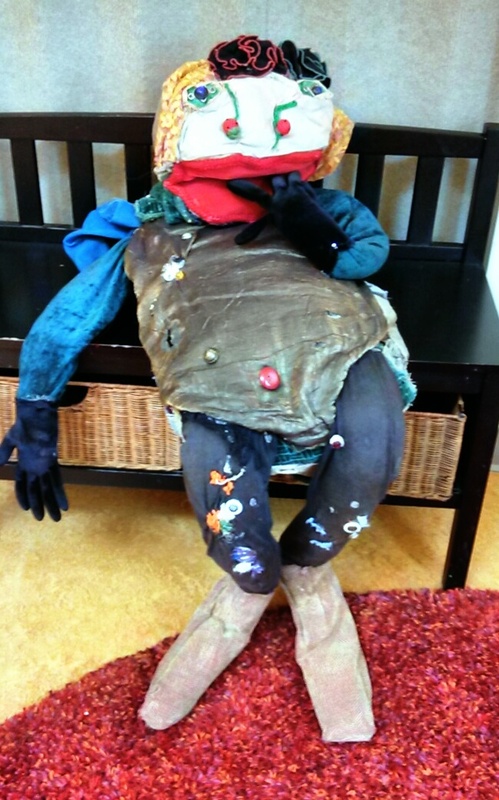 Then, I folded Turtle back into his shell and put him away on the rocking chair, telling the puppet, “When the children are no longer afraid, you can come out and play.” I used my “Turtle voice” to let the children know that Turtle did hope to become their friend as he’d never, ever hurt them. “I’m not afraid of you,” said one of the children. “I’m going to play with you now. I’ll make something for you. Snowflakes!” She went to the shelf where the stuffing was kept and began to tear it into snowball-sized pieces. She put them all in a paper bag and brought it over to the rocking chair. Showering Turtle with snow caught the attention of other children, who then helped her pile snowballs on top of Turtle. As they played and laughed, the child who had been scared came closer to the large puppet. She whispered to me that she had made something with arms for him. She wanted me to deliver it on him, while she remained at a distance. As the other children continued to have fun piling the snow, the girl drew closer and closer. Soon, she, too, was putting snow atop Turtle. She began to animate the large puppet and interact with the younger children. “Who wants to give me a high five,” she said wiggling Turtle’s fingers. The 3 year olds, who had previously shown no interest in the large and rather unusual puppet, hesitantly came forward. The older girl continued speaking in her “Turtle voice,” and soon those with finished puppets came forward and began playing with Turtle. If you’re like me and couldn’t discard all that precious holiday wrapping material, here’s a suggestion: offer those cardboard inserts, tubes, wrapping paper and bows to the children for their creative pleasure. Art-making from the recyclables is one way to find enjoyable closure to the holiday season (which seems to be starting earlier each year). After months of excitement and anticipation, having easily-accessible resources for artistic expression diminishes the post-holiday slump. Find containers. 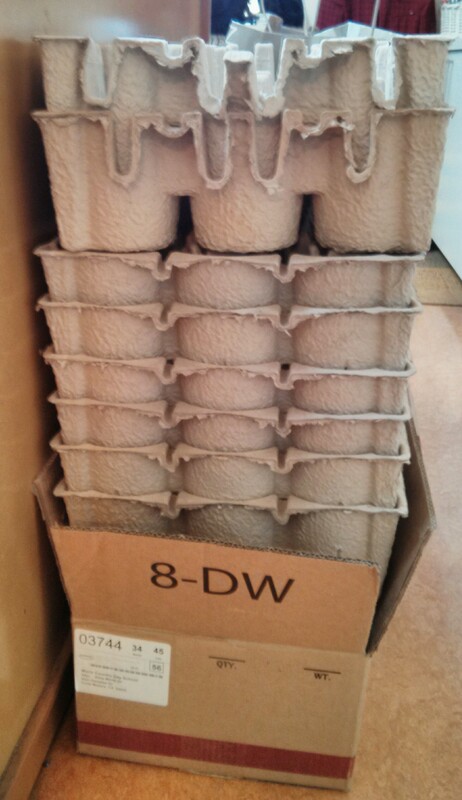 Depending on available space and aesthetics, you can use anything from cardboard boxes to beautifully-crafted ones. Children’s resourcefulness comes into play as they create from the materials they find around them. Once alerted to this “treasure-finding,” the children themselves will add to their supply. You may need to use the cover of night to do your recycling once children discover the joy of creating with these readily-available materials. There are families who bring in shopping bags of recyclable material. Parents hold the bag and the children sort and place the items into the containers. When we run out, I have the children draw a picture of what is needed and those who love letters will add words, such as “Wish List” or “Please Bring to Expressive Arts.” In no time, the empty containers are filled again. In this way, the children take some responsibility for claiming Expressive Arts and doing their part to keep the program supplied. Feeling helpful and responsible expands their sense of belonging; being part of a community. Beyond the fun and creativity, the skill-building, the process or product is the spirit of connection that surfaces. There are many moments in each day when I feel the quiet joy of children creating, collaborating and assisting each other. I become aware of the community spirit flowing to and from the classroom and am so grateful to still be teaching 28 years from the program’s conception. This idea of children, their families and teachers working together creatively is a simple means for modeling a better, more peaceful world. Wishing you all Peace and Plenty in 2014. “Can I play with you?” is often heard throughout our classrooms and school yards. This seemingly simple request can quickly become a lament when new children are stopped from joining the play in progress. While excluding is often a means of exerting power or defining friendships, it can also be sourced from a fear of the new person changing the play. 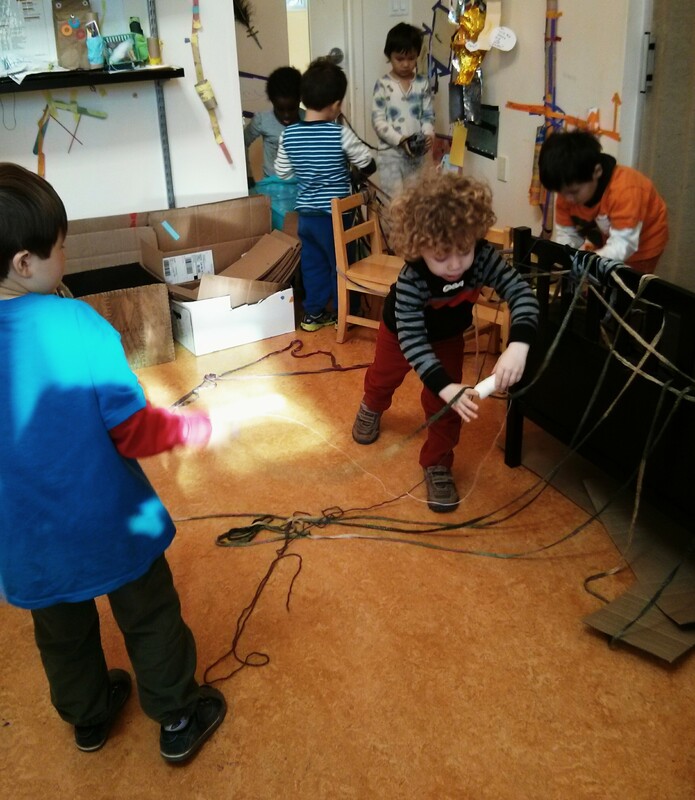 Entering play is a social skill that can be learned with our repeated facilitation. Inquire as to what the play is about. What characters are the children portraying? Ask what would add to the play in progress? What else might be needed, whether it’s another character or a prop. Stand by to see if they’ll need additional help. Three children were playing family. They were riding in a car they’d formed from a wooden bench. Another child was observing them from nearby. 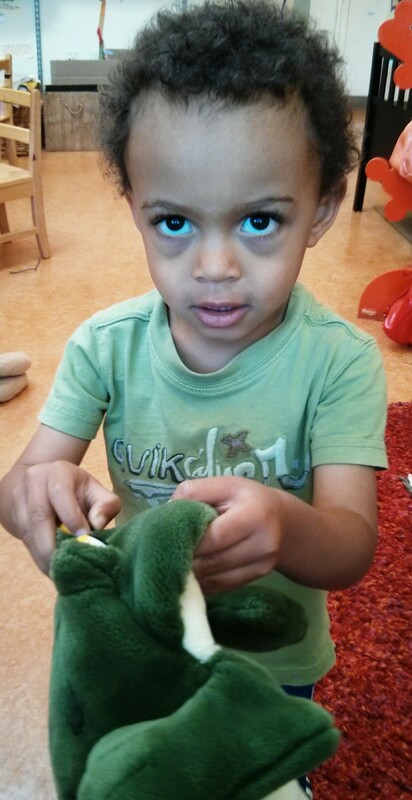 He loves animals and had been playing with a frog puppet until the dramatic play caught his attention. While he had been perfectly content to be animating his puppet, I wondered if he might want to join in. When I asked him, he nodded agreement, but remained still and continued watching. Then everyone will say hurray! Play together we all win! It was a tune that a classroom teacher and I had collaborated on as a way of encouraging children to enter play with successful outcomes. “No, thank you,” was the reply from “mom.” For the older children, I offer or brainstorm other suggestions. With the youngest, if a coaching suggestion has been turned down, I often step in and help facilitate. “He’d like to play with you, who can he be in the family?” The game initiator suggested that he be the daddy. “Would you like to be the daddy?” I asked. He thought for a moment, then told me, “No, I have a daddy at home.” And with that he turned and walked away to continue playing happily with the frog puppet. I forget at times just how real their play can be. And while we may try to scaffold, ultimately it is the child who decides. As written in the blog of Dec 4, 2013, one child’s idea for making a “sewing machine” continues to attract many of his peers. 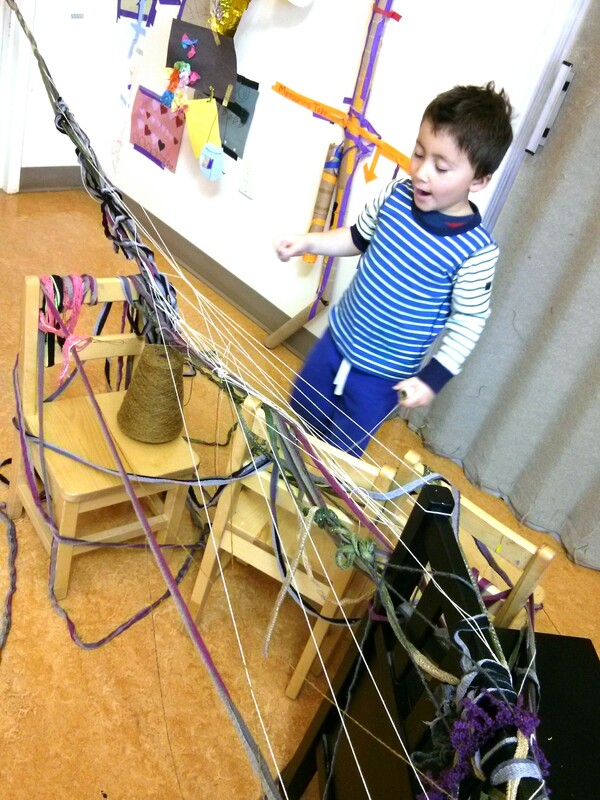 They each have a ball of yarn and invent ways of connecting and weaving and pulling on the yarn to create movement. Not all the children have learned to enter play in a way that keeps the original idea moving forward. I observed a child picking up scissors and moving toward the string-structure of his peers with a mischievous gleam in his eye. What do you think will happen if you cut down the string? How will the children feel? Did you want the children to be upset, or did you just want to join in their fun? What could you do instead? He decided to exchange the scissors for a ball of yarn and was welcomed into the activity. Learning how to enter play successfully is a life skill. Once inside the play, we can offer our ideas with a better chance of creating collaborative change. “Where are the paper bags“?” a 3 year old shouts immediately upon entering the room. I show where they are kept on the art cart and he brings a handful to the table. “Where are the eyes? We need eyes, lots of eyes”!” cries another, as I bring the wiggly eyes down from a higher shelf. Some things are purposefully out of reach of the youngest. When it comes to small items, for safety sake, I like to keep my own eye on their usage. While these same materials were used in previous puppet-making sessions, as loose parts they can be used in many ways. 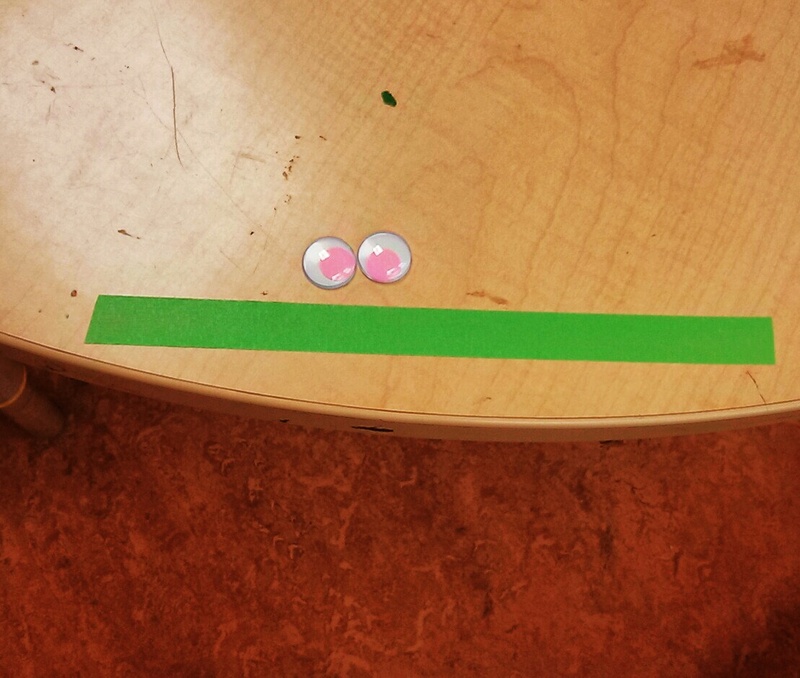 “It’s a smile, a green smile,” laughs another child placing a piece of colored masking tape directly on the table underneath two pink eyes she’d chosen. She continues taping around her work, saying, “It’s a bus. He’s riding a bus.” I chuckle at the little creature she’s brought to life with only wiggly eyes, tape and her own inventiveness. 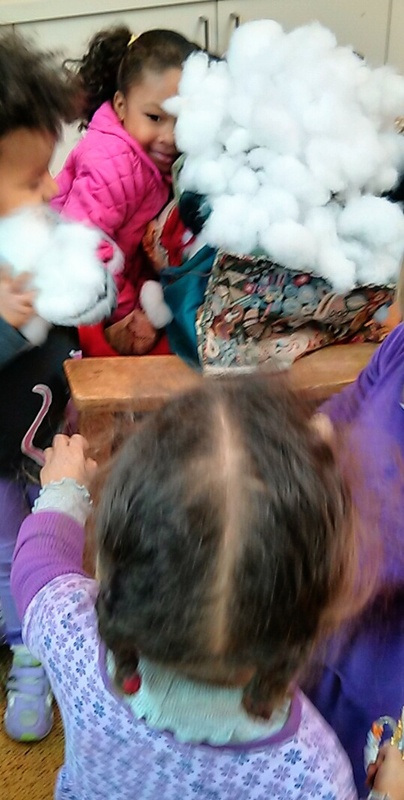 “Are you making puppets?” “popped out” to a resounding “Yesssssss” from several of the children. 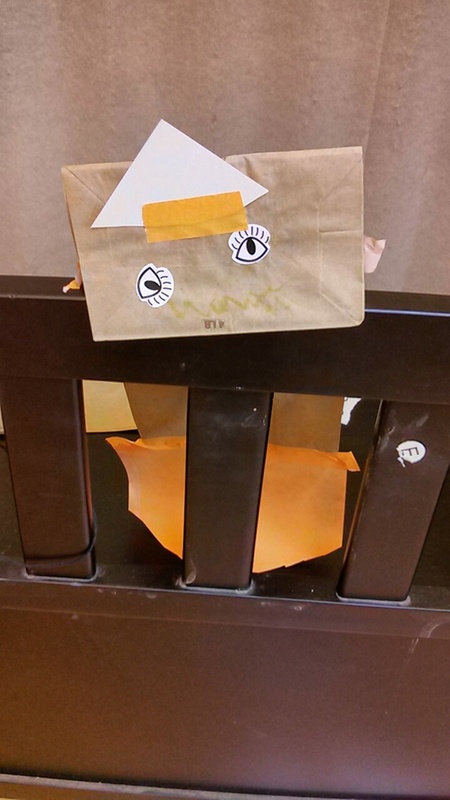 As paper bags and wiggly eyes have been recently added to our open-ended “staples” in the art cart, I notice the 2-3 year olds choosing them repeatedly. 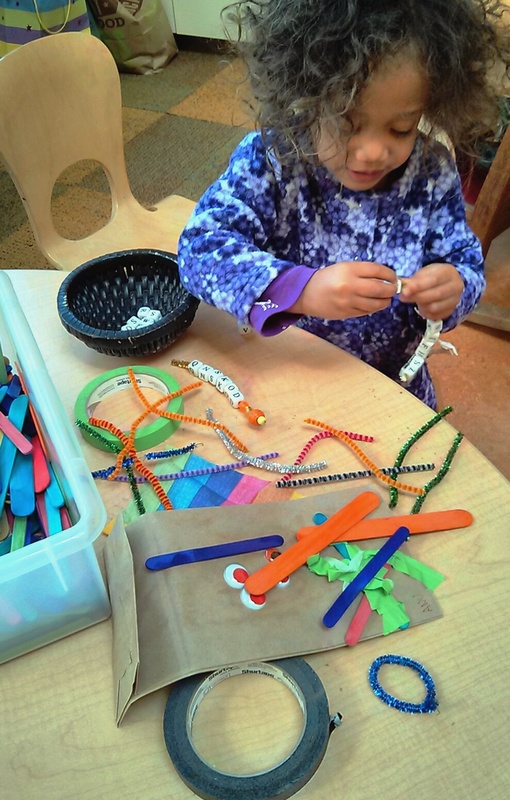 Having materials from favorite activities available and accessible to the children encourages extended focus, exploring, self-direction and independence. 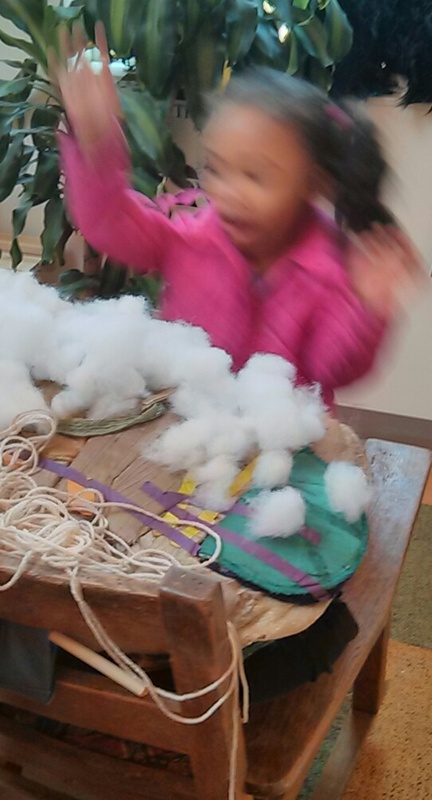 With accessibility and choice, many children are taking greater risks in their puppet making. 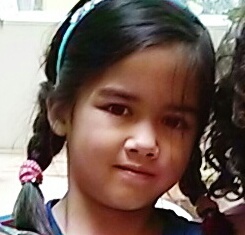 Previously, only eyes and perhaps a smile were represented by most of the children. Now, they are elaborating on their creations. They often choose materials that build on their last experience. They also taste (sometimes quite literally) the materials brought to the table by other children. Besides the staples, offering new materials adds excitement. More children become interested in the process as different materials are introduced. 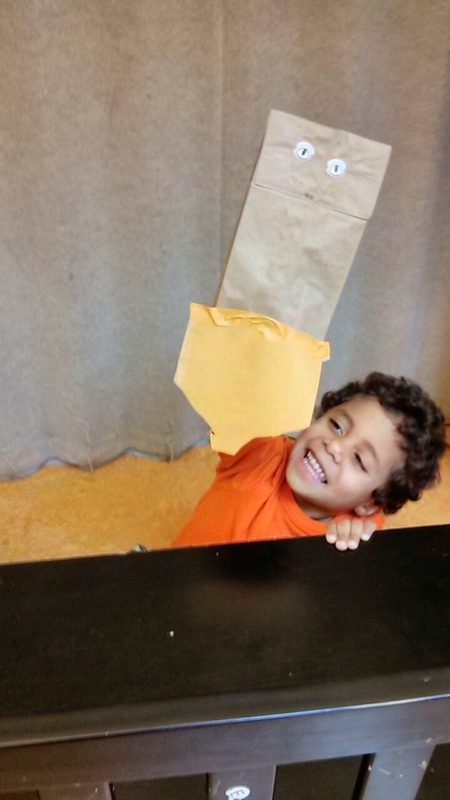 I watch another 3 year old deliberately choose and place his materials on a paper bag. The face itself was made from a piece of fabric that had been donated that morning by a parent. She was recycling her son’s Rainbow Ghost Halloween costume, which included the striped sheet and wild, fake fur. Colored sticks became the catalyst for the “matching” stripes on his puppet’s clothing. It was delightful to witness the creativity shown by the child. This 3 year old had found a way to express himself uniquely. That’s the beauty of open-ended materials. Who would have imagined creating both a smile and striped clothes using the colored sticks. I’ve offered some of the same materials for decades and continue to be surprised by how each child uses them. As teachers, we provide the materials and assist as skills are being mastered. The children provide the endless creativity and imagination. A 2 year old is mastering two skills, stringing beads and cutting sticky tape. Using the beads (also kept high), she made a necklace for her puppet and a shiny pipe cleaner. She then went back to the task of cutting the desired length of tape without tangling it. Children often take natural breaks and work on another part of their project. Those who persevere with neither breaks nor success have an opportunity to learn a new feeling for their emotional literacy vocabulary: frustration. This then becomes an opportunity for group learning, with the children volunteering what helps them when frustrated. Having observed these young children stay focused on their puppets for almost an hour of joyful creating, I felt hopeful and optimistic about the state of our future world. I couldn’t help but think of how this self-directed play could be added to their repertoire of peaceful expression in their lifetime of learning toolbox. Your open-ended supplies, such as colored tape, wiggly eyes, feathers, string, yarn, oil pastels, paper, paper bags and markers can be supplemented with gathered and parent/community donated materials. Families are very willing to bring in offerings for the children’s art making. You may want to post or let parents know of your wish list. 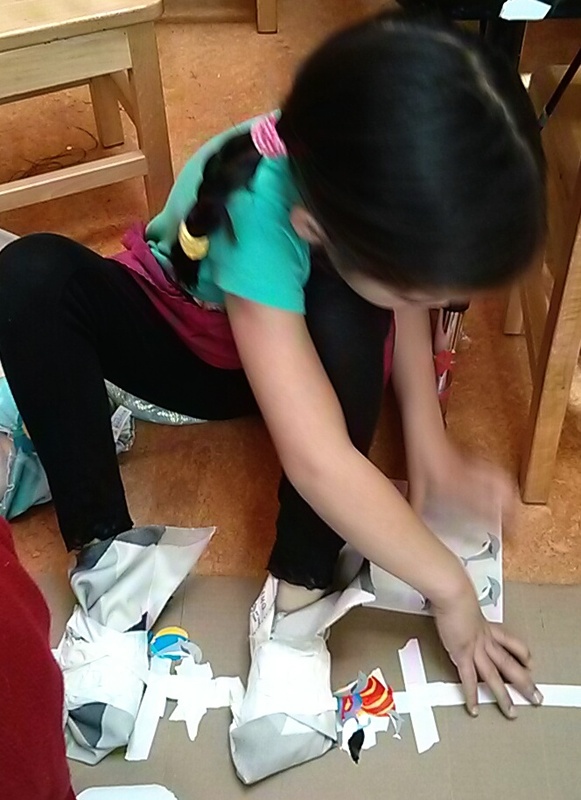 Beautiful wrapping paper, small cardboard boxes, packing foam, anything that does not dictate how it is to be used is a resource for the children’s creativity. 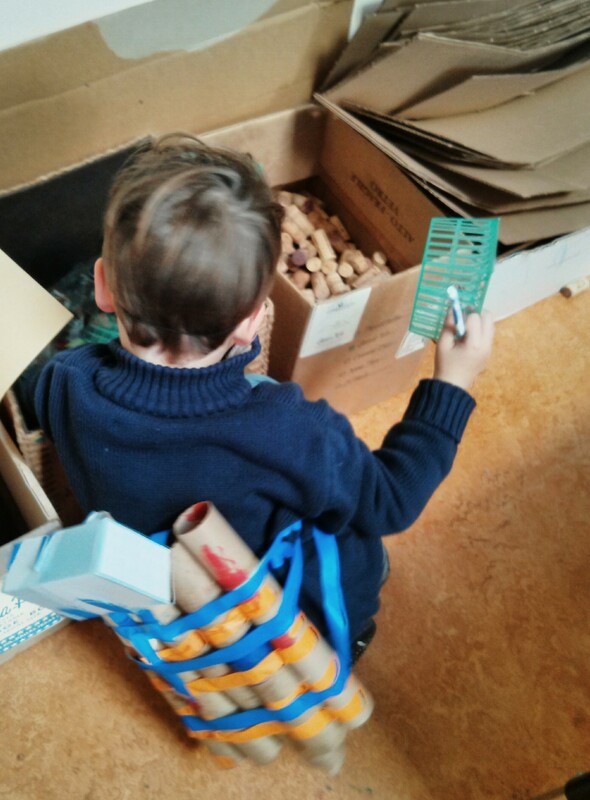 We do not need to constantly change the loose parts, fearing the children will become bored. Their resourcefulness will utilize the same materials in many different ways. 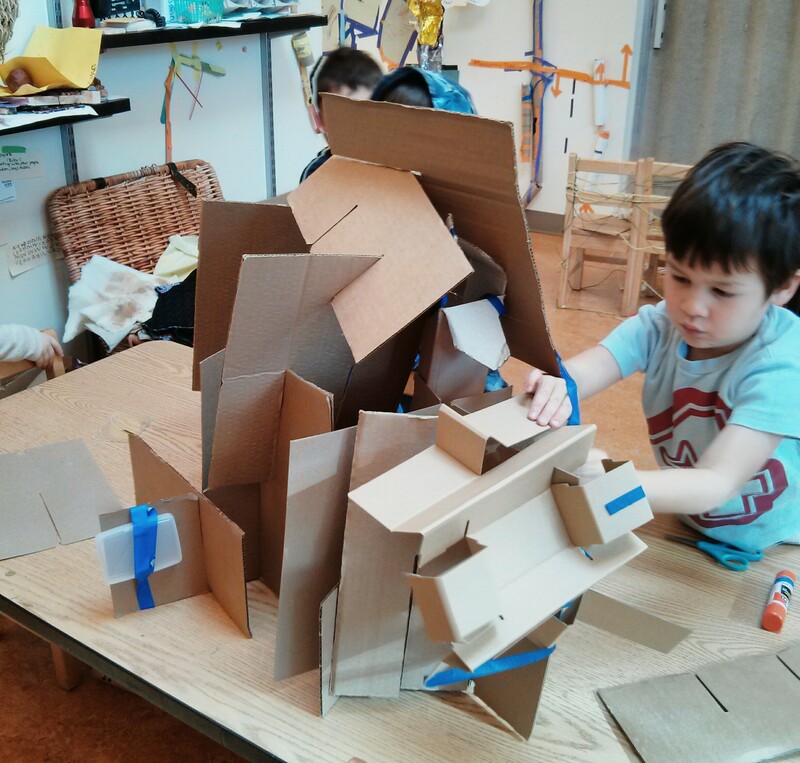 They have the capacity to expand their art-making as far as their imaginations will take them. Observing children’s actions through the lens of what they were capable of, including what we don’t initially see as such, sparked my thinking. While we often share with parents and other staff members anecdotes about children’s learning, less often do we bring the children themselves into the conversation. Since Deb’s presentation, I have been increasing my comments directly to the children. From making designs with tubes and tape, this same child stretched his exploring to create designs with the tape itself. Another child, who had recently become interested in recycled materials, quickly began to expand the size and purpose of his art. He went from handheld objects to those he could put his whole body into. E-mailing home photos and text of observations and appreciations widens the circle of encouragement. It brings in the perspectives of the parents and family members and strengthens the bridge between school and home. By modeling appreciation for their growth and authenticity, we give children a framework for valuing their own experience and learning. Hopefully, it can assist in creating a structure not based on comparison with others, but rather on appreciating their own interest, progress and mastery. By doing this, we help set our children on course for a lifetime of authentic learning, as well as greater inner peace and happiness. Making time to observe the world of children and what they are mastering is invaluable. While I am privileged to work with small groups, where witnessing each child’s learning is simpler, the classroom teachers have observations built into their schedules. Hats off to the leadership of our director! Work with your teammates to create a regular observation time. You could observe a small group of children, while your teammates have the remainder of the children in your outside space. While a 1/2 hour is recommended, even 15 minutes will be of benefit. If separating the group to be observed is not possible, have your teammates be responsible for the majority of the children while you observe a smaller group. Trading off being the observer will keep things fair. You might want to wear a sign that designates you as an observer so that the children get used to your silent witnessing. At first, they will likely ask you lots of questions and try to engage you. You can let them know that you’re doing important work: watching all the amazing things they do. You can tell them that you’d be glad to share your observations with them afterwards. 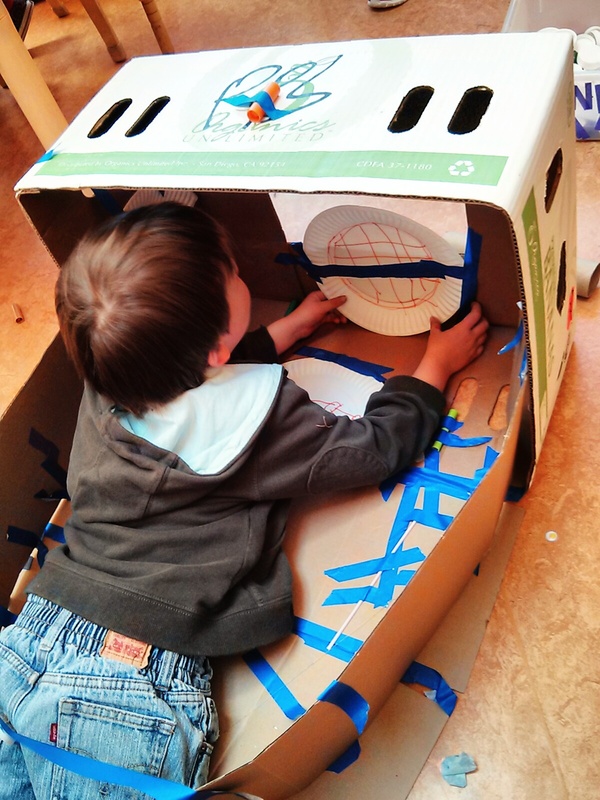 The same recycled materials can be an ongoing source of engagement for children. I remember thinking that the children would never stay interested in toilet paper and paper towel tubes. I am happy to report my error. These easily collected loose parts remain favorites. For lenses of observation and many other wonderful ways of viewing children’s play as connected to learning and development theories and research, I enthusiastically recommend Reflecting Children’s Lives: A Handbook for Planning Your Child-Centered Curriculum by Deb Curtis and Margie Carter (Redleaf Press, 2011). Twenty six years ago Elyse Jacobs, who has an MFA and a certificate in Art Therapy, developed a program of conflict resolution for young children. The program later became known as Tools of Peace. 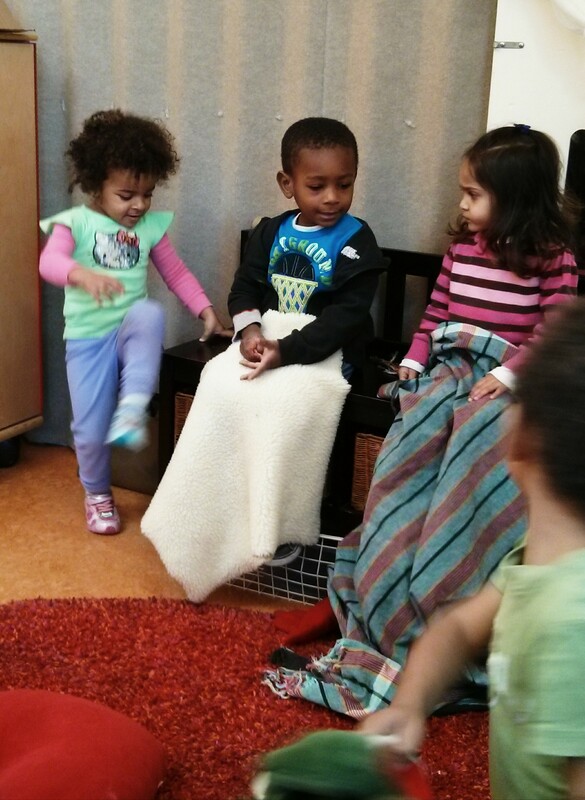 Currently, the program is established at two sites of a private preschool in San Francisco. The children learn, through their art activities and social interactions, to develop their own voices, listening skills, shared kindness, creative solutions, emotional literacy, how to enter play and develop friendships. Elyse continues to find joy through hands-on teaching. She also mentors other teachers in developing the skills discovered from creating her Tools of Peace program. Additionally, she consults and coaches the families of elementary-aged children in raising levels of emotional intelligence and connection. In her own words: "The children have taught me so much, I feel compelled to pass on what I've learned in gratitude for all I've learned."